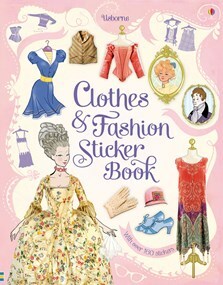 A lavishly illustrated book packed with over 160 stickers of fabulous fashions throughout history - a young fashionista’s dream! From Romans in draped togas, to Elizabethans in lace ruffs and Victorians in tight corsets, there are hundreds of sumptuous clothes and accessories to discover. Includes a mixture of photographs, paintings and illustrations to bring the fashions of the past to life, as well as fascinating facts about fashion through the ages. Every little girl loves fashion. Take her on a walk down memory lane with fascinating facts that look at fashions through the ages from ancient times right up to the modern age.